So, let’s examine what someone wrote for Trump as he campaigns for a second term and a Congress controlled by Republicans who will not hold him accountable for anything. 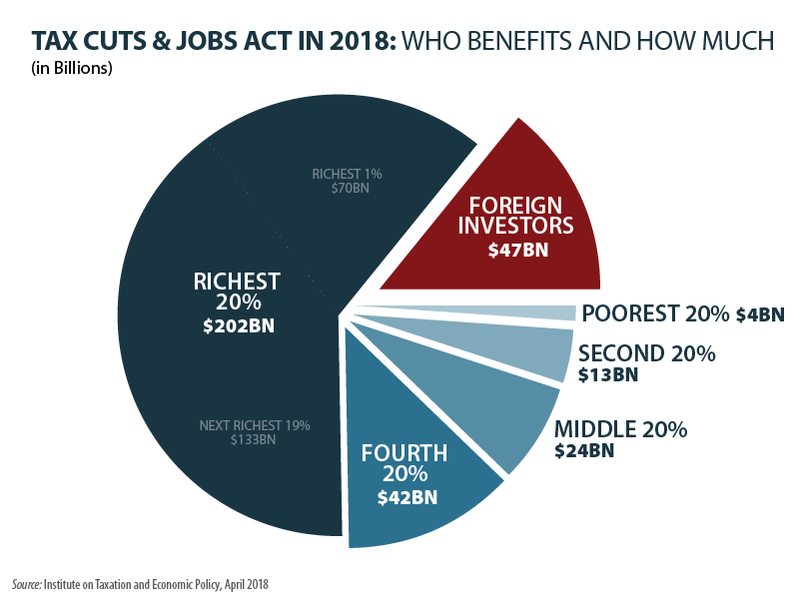 The 2017 Tax Cuts and Jobs Act was, for sure, a major change in American tax law. But it was anti-reform. Dictionaries define reform as improving conditions, even putting an end to an evil. Taxes are so central to having a country that we replaced the Articles of Confederation government with our Constitution specifically to grant Congress the power to tax. Just as Trump insists we “don’t have a country” without his Mexico border wall, for sure we don’t have a country without taxes. In American political debate, the Republicans had, until Trump, defined tax reform to mean the share of the economy going to Uncle Sam would be unchanged, they call it “revenue neutral.” They also had, until Trump, declared that any reform must not add to the national debt, which is, simply, taxes deferred to the future—with interest. The Trump Republican tax law abandons any pretense of concern about debt and shows how the real purpose of the bill is to deliver an avalanche of tax savings to the already rich while tossing a few greenbacks to the vast majority. Indeed, because many of the individual tax cuts are temporary, in 2027 the bottom 60% of taxpayers will actually see their income taxes rise, analysis by the nonprofit Institute on Taxation and Economic Policy shows. The group’s past projections have proven reliable over time and President Reagan even changed his tax policy because of the work of an affiliate of ITEP. 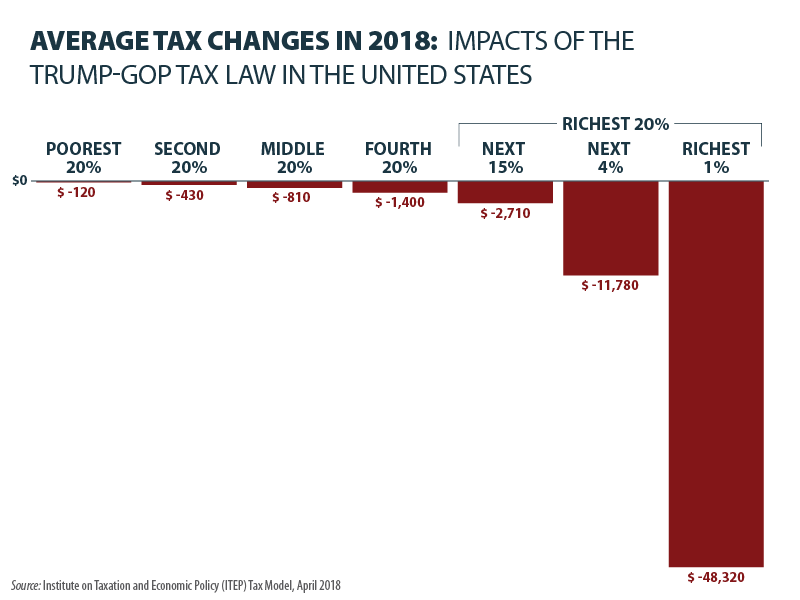 The Trump tax law showers more than 50% of the individual tax savings on the 5% of taxpayers with the largest incomes. That’s $800 for those in the middle, compared to $55,190 for the 1%. For each dollar of reduced tax for the middle fifth of taxpayers, the 1% will save $69. The Trump-Republican tax cuts are being financed with borrowed money, adding a dime to every dollar of the public debt that Trump the candidate decried as a danger. He told voters that if elected he would pay off the national debt within eight years. It was pure nonsense, but it sure sounded good to millions of gullible voters. He also threatened to default on the national debt, which would have ended the dollar as the currency the world uses to conduct business—a huge economic benefit to the U.S. This from a man who has a degree in economics from the University of Pennsylvania. Next, the USA Today op-ed written for Trump declares that” the standard deduction has been nearly doubled, so now twice as much income is earned tax-free.” That’s misleading in the extreme. Candidate Trump said married couples would not pay federal income taxes on the first $50,000 of income each year. The bill he signed into law set the threshold at $24,000, less than half what he promised. Had the law been left untouched a married couple with two children would’ve paid no taxes on their first $22,000 dollars of annual income thanks to the personal exemptions which the Trump tax law has now eliminated. Trump makes no mention of eliminating personal exemptions. At every opportunity, Trump declares his love for police. But the law he signed took away significant tax benefits for cops, who can no longer deduct the cost of uniforms, guns, ammunition, batons, Sam Browne belts, dry cleaning their uniforms and union dues. That’s because Trump eliminated the “miscellaneous” deductions taken by many first responders. Not a word about that in the op-ed. Trump touts the creation of 3 million jobs since he won the Electoral College. Of course, America has only one president at a time, so Trump is taking credit for more than 600,000 jobs created on Obama’s watch, a fifth of the total Trump claims credit for. Let’s see if in the future he always takes the credit, or blame, for things that happened when he wasn’t in office and had no power. By the way, there’s no mention in the USA Today op-ed of the 1,100 Indiana jobs Trump claimed he saved. As we reported in June 2017, those jobs are gone. Interesting how our friends in the news business were all over the first part of that story, but not the follow-up. Also hardly mentioned in the news is that under Trump job growth is 17% less than during President Barack Obama’s second term. Jobs grew at an average of 217,000 per month then, but at only 181,000 per month since Trump took office. Utility rates are set by regulators, including prices paid for power in the half of states with electricity “markets.” We put markets in quotes because, as I have shown time and again and so have others, these markets are easily rigged to inflate prices. Utilities that distribute power to homes and businesses charge rates that are supposed to provide “just and reasonable” profits and equally “just and reasonable prices.” When tax rates fall then the costs used to set rates should, also. But it’s not the companies that do this and in general, the state utility boards have been slow, if inactive, in lowering rates to reflect the 40% reduction in the corporate tax rate that Trump signed into law. Make it a point right now to write down your income tax rate for 2017. Take the figure on Line 56, your total income tax after credits, and divide it into the Line 38, your adjusted gross income. That will give you your Effective Tax Rate or ETR. Next year do the same. The line numbers may change so pay attention to your adjusted gross income and your total tax after credits. See how well you did. Here’s a good bet. Your taxes may go down a few percentage points, especially if you make under $100,000 and have children. But will they go down by 40%, the tax cut for corporations?